F. E. Warren Air Force Base operates 50 Peacekeeper Missiles and 150 Minuteman III Missiles as part of the United States strategic defense. Nearly 4,000 military personnel and 600 civilians operate and maintain the base which covers 5,866 acres at the main base near Cheyenne, Wyoming, and 220 remote missile facilities spread over 12,600 square miles in Wyoming, Nebraska, and Colorado. 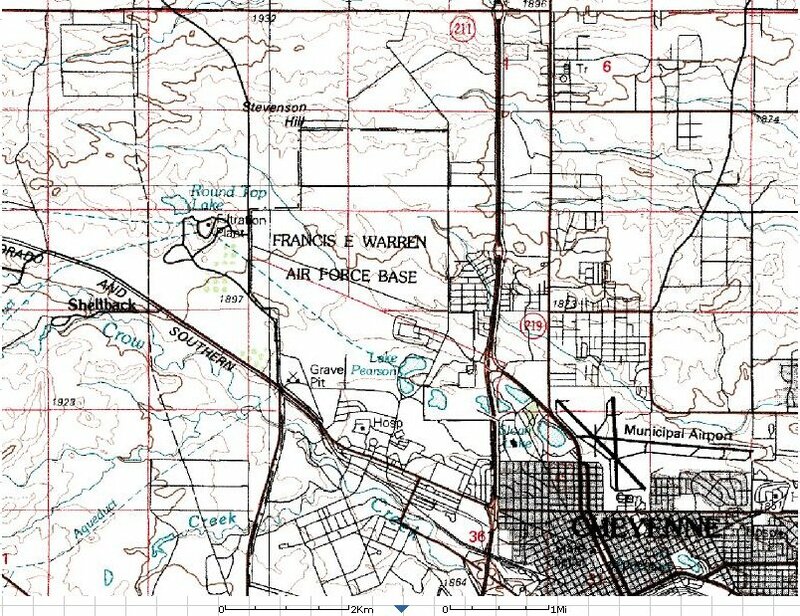 Francis E. Warren AFB near Cheyenne Wyoming is one of four strategic missile bases in the United States. The base has the distinction of evolving from a noteworthy frontier infantry and cavalry post into the largest, most modern strategic missile facility in the United States. The history of the base dates back to the Railroad Act of 1862, when President Lincoln and Congress set plans for the transcontinental railroad, including a military installation on the eastern slope of the Rocky Mountains in the Wyoming Territory, to protect Union Pacific workers from hostile Indians. On July 4, 1876, the railroad established its mountain region headquarters at Crow Creek Crossing, later known as Cheyenne. A few weeks later, the U.S. Cavalry moved from temporary headquarters in Cheyenne to a point three miles west and established Fort D. A. Russell. The Fort was named after a Civil War hero killed in action at Chantilly, VA. Thus, 1867 was the beginning of a city and a fort, and both have grown together over the years. The new fort was built next to Crow Creek and was strategically located halfway between Mexico and Canada - only a few hundred miles closer to Los Angeles than to New York. Fort Russell was made a permanent post in 1884 because of it's strategic location. In 1885, the War Department ordered the post be rebuilt to serve eight infantry companies. The Army built 27 red brick buildings for $100,000, to replace the older wood frame structures and planted thousands of trees. Largely due to the influence of Senator Francis E. Warren, Ft D. A. Russell was selected in 1902 for expansion to house a headquarters company, 122 companies of infantry, and I battery of field artillery. In 1905 Ft D. A. Russell was enlarged to a brigade-sized post and 150 buildings were erected between 1905 and 1913. In honor of Senator Warren and his tremendous impact on the development of Ft D. A. Russell, the post was renamed Ft Francis E. Warren in 1929. In 1906, Secretary of War William H. Taft recommended For Russell be expanded to a brigade-size post. By 1910, the construction of red brick quarters, two-story barracks, offices and stables had tripled the area of the post. Construction of new brick buildings continued into the 1920's and helped establish a military construction pattern at posts throughout the nation. During this era, artillery units were assigned to the post, and the size of the facility increased in size to accommodate the area needed to train soldiers with the latest 20th century weapons. >As one of the oldest continuously active military installations in the United States, F. E. Warren AFB's history is well preserved. The major features of the National Historic Landmark are the impressive brick structures that comprise the central core of the base. The current historic district contains more than 200 red brick Neo-Colonial Officers' and NCO quarters, stables, barracks, administration buildings, and hospitals constructed between 1885 and 1913. Additional officers' and NCO quarters, a theater, gymnasium, and administration buildings were constructed in the 1930s. These buildings, with their regular spacing, repeated architectural style and design elements, aligned on large parade fields, create a uniform and impressive atmosphere which retains the spirit of the early military presence on the western plains. During World War I, the post served as a mobilization point and training facility for artillery and cavalry groups. As World War I began, Fort Russell had become one of the largest military posts in the United States. The post airfield was first used in 1919 by the "Western Flying Circus" led by-then Major Carl "Tooey" Spaatz (later promoted to general and the first Air Force Chief of Staff). Later that year, 125 aircraft used the field, located in today's Wherry housing area, to determine the feasibility of transcontinental air service and air mail delivery. The success of these tests led to the development of the Cheyenne airfield in 1920 and the abandonment of the post's airfield. In 1927, the last cavalry units left, ending 60 years of cavalry history at Fort Russell. In 1930, President Hoover issued a proclamation changing the name to Fort Francis E. Warren, honoring Wyoming's territorial governor and first state governor. Warren was a U.S. Senator for 37 years. In 1949, 80 years after its founding, the fort became Francis E. Warren Air Force Base. As an Air Force Installation, the base was first used as a training facility. The base joined Strategic Air Command in 1958 and organized the nations first wing dedicated solely to intercontinental ballistic missile operations. Atlas D and E missile sites in eastern Wyoming, western Nebraska, and northern Colorado were placed under the command and control of F.E. Warren. In 1960 and 1961, Atlas E missiles were delivered to prepared sites located in the vicinity of Grover, Briggsdale, Nunn, Greeley, and Fort Collins. Placed horizontally in "coffin" shelters, these missiles of the 549th (later 566th) Strategic Missile Squadron remained on alert status until March 1965. On November 21, 1957, the Department of Defense announced that F.E. Warren would become the nation's first ICBM base. Shortly thereafter, the base shifted to the Strategic Air Command from the Air Training Command. Originally, the project design for the above-ground Atlas D ICBM launch and control facilities at "Site A" was to be completed by mid-May 1958 and construction finished in November 1959. However, design revisions forced addendums on the bid packages delaying the bid opening to July 15, 1958. To meet a previously set June 30th bid award deadline, the package was advertised without the critical Propellant Loading Skids, instrumentation, controls, expansion, anchorage and structural support, and site power facilities. 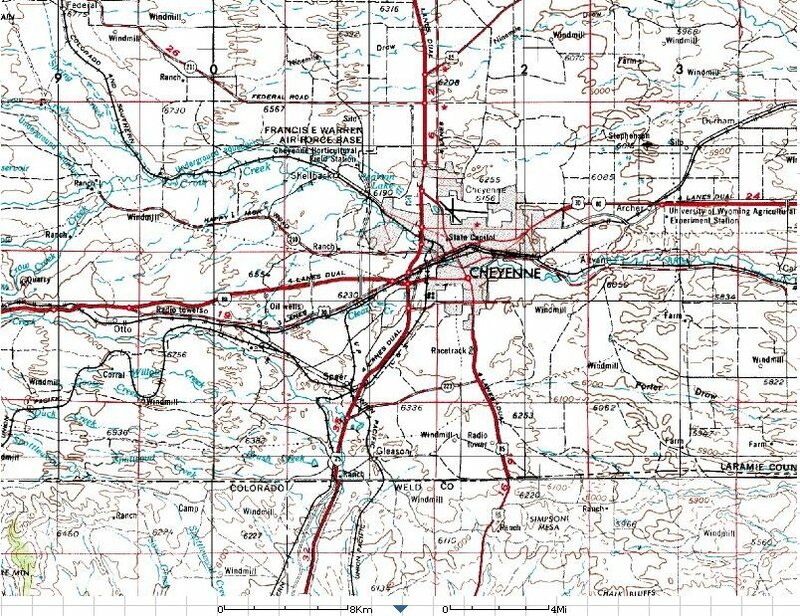 Despite these gaps, construction began at a location 23 miles northwest of Cheyenne for the facilities of the recently activated 706th Strategic Missile Wing. The Omaha District of the Army Corps of Engineers oversaw the construction at "Site A," which eventually consisted of two above-ground complexes with three launchers each. Because the Atlas D was radio-controlled from the ground, the launchers had to be clustered close to the radio transmitters. The prime contractor, the George A. Fuller Company, worked through the fierce winter of 1958-1959 to get the job completed in 190 days. The project was not without problems, and many of these problems would later plague the construction efforts at other ICBM sites. Inexperience, time pressure, remote locations, and constant modifications required to adjust the facility to support an evolving missile design hampered the construction effort. At Site A, also known as "Warren I," 35 modifications were made to the guidance facility and 117 to the launchers before Fuller completed the contract. The were four work-stoppages over issues such as pay, hours, and the presence of non-union workers. There were no fatalities at this project; moreover, the number of disabling injuries was just below the average for all Corps of Engineers projects and about six times better than the national average. On September 15, 1959, the first Atlas D missile to deploy away from Vandenberg AFB, California, went to the 564th Strategic Missile Squadron stationed at Warren I. A month later, F.E. Warren became the recipient of the first air transported Atlas missile. With General Power (the Commander in Chief of SAC) present, the first Atlas D complex was turned over to the 564th SMS and declared operational on August 9, 1960. As work proceeded at Warren I, the Corps contracted for yet another complex. In February 1959, bids were opened for "Warren II," a complex that would have three sites with three Atlas D launchers at each. 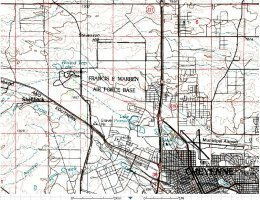 The Blount Company won the bid to build "annexes B, C, and D" to be scattered to the northeast, southeast, and southwest of Cheyenne. Slow material deliveries, modifications, and 11 different work stoppages hindered the construction of these complexes. Slated for completion in February, Warren II was finally ready in the summer of 1960. The 565th Strategic Missile Squadron, activated on December 1, 1959, operated the nine launchers. On a positive note, the safety record at Warren II exceeded that at Warren I. The Martin K. Elby Construction Company of Wichita, Kansas, submitted the low bid to construct Warren III, which would host the Atlas E missile. Because the Atlas E contained inertial guidance, the launch sites need not be concentrated. Nine Atlas Es would be scattered over a go-square-mile area at single "coffin" launch sites. The term "coffin" was used because the missile laid on its side underground with the coffin roof at ground level. This configuration offered limited protection for the launcher. Work began on December 7, 1959. Coffin launchers in Wyoming were at Chug-water, Lagrange, and Pine Bluffs. One Atlas E launcher was located in Nebraska and five launchers were placed in Colorado at Grover, Briggsdale, Nunn, Greely, and Fort Collins. As with Warren I and II, problems plagued construction. Delivery of steel was erratic in the wake of the national steel strike. Because of sites located in three states, the contractors had to recruit labor from many different locals. Consequently, work stoppages occurred at some individual sites while labor harmony prevailed at others. There were nine disabling injuries. Again, Propellant Loading System (PLS) skids proved to be a challenge. In fairness to the contractor, Blaw-Knox, the Corps of Engineers admitted that compressed times for design and fabrication of this system and the attempts to use "off-the-shelf' components such as valves led to problems. Because of the rush to deploy, a prototype PLS for test and evaluation was not built. Construction difficulties encountered at Warren and other ICBM sites would lead to an inter-service dispute over construction management. Eventually, the Corps of Engineers Ballistic Missile Construction Office (CEBMCO) was formed to oversee construction. On October 1, 1960, the 549th Strategic Missile Squadron became the last Atlas E SMS to be activated. The 549th SMS was redesignated 566th SMS on July 1, 1961. On that same date the parent 706th Strategic Missile Wing stood down. Command responsibilities at Warren were assumed by the recently activated 389th Strategic Missile Wing. In May 1964, as the Atlas D missiles were being phased out, the 389th Strategic Missile Wing received SAC's last operational readiness inspection for this system. In September, SAC deactivated the 564th SMS. During the following March, the 566th SMS would also be deactivated, completing the phaseout of the Atlas E at Warren. The departure of the Atlas squadrons did not mark the end of F.E. Warren's role in the ICBM program. On July 1, 1963, the 90th Missile Strategic Missile Wing became the largest ICBM unit. It controlled 200 Minuteman I missiles in the tri-state, 12,600 square-mile area. The Minuteman I sites were converted to Minuteman IIIs in 1975, and in 1986 F.E. Warren AFB became the only base in the nation to deploy the Peacekeeper missile. 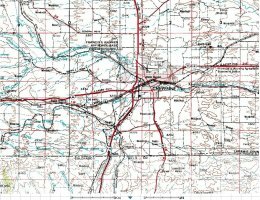 On October 15, 1962, Morrison-Knudsen and Associates won the contract to construct 200 Minuteman silos over an 8,300-square-mile area of Wyoming, Nebraska, and Colorado, located north and east of the base. Morrison-Knudsen subcontracted the task of excavating the silos to the Meridith Drilling Company of Denver. Meridith used an innovative technique of equipping cranes with 6-, lo-, and 15-foot diameter augers. These "biggest post-hole diggers on earth" allowed the crews to average drilling out one silo per day between November 1962 to June 1963. The first site, A-6, reached completion on October 2, 1963. Besides the innovative drilling technique, the project was blessed with milder than normal weather conditions, which allowed for accelerated progress during the winter months. But access to the 200 sites proved to be a challenge. Thirty-eight miles of off-site roads had to be constructed. The Corps of Engineers Omaha Office handled numerous complaints from local owners claiming property damages. The presence of a Missile Site Labor Committee helped alleviate labor problems. The four work stoppages caused minimal impact to the construction effort. During construction, five fatalities occurred. While construction proceeded, on July 1, 1963, the Air Force activated the 90th Strategic Missile Wing. Over the next year, the four component strategic missile squadrons activated with the 400th SMS became the last Minuteman I "B" unit to stand up on July 1, 1964. In November 1972, SAC initiated the Minuteman Integrated Improvement Program. The program entailed silo hardening and upgrading command data buffers, which allowed for quicker missile retargeting. In addition to receiving upgraded silos and launcher control facilities, Warren also received new missiles. With conversion to the Minuteman III model, Warren's last Minuteman I model went off alert status in September 1974. On November 22, 1982, in a decision statement for Congress, President Ronald Reagan stated his plan to deploy the MX missile dubbed "Peacekeeper" to superhardened silos located at F.E. Warren. The Vice Commander-in-Chief of SAC, Lieutenant General George Miller, explained that location, geography, and geology were key factors for selecting the base. The initial plan was to deploy 100 Peacekeepers in silos of the 400th and 319th Strategic Missile Squadrons. In July 1984, construction began for Peacekeeper support facilities at Warren. From 1986 through 1988, 50 Peacekeepers would be backfitted into silos formally occupied by Minuteman IIIs of the 400th Strategic Missile Squadron. By the end of 1988, deployment was complete with 50 Peacekeepers replacing 50 Minuteman IIIs. Boeing Aerospace Company served as the primary contractor for reconfiguring the silos to accept the new missile. Unlike Minuteman, which was placed in the silo with a special transporter erector, Peacekeeper had to be assembled stage-by-stage within the silo. After an Air Force restructure in June 1992, the 90th dropped its "strategic" designation and became the 90th Missile Wing. SAC was inactivated and Warren belonged to Air Combat Command, headquartered at Langley AFB, VA. On July 1993, the realignment of the Twentieth Air Force from ACC to Air Force Space Command moved the responsibility of ICBM operations to AFSPC, headquartered at Peterson AFB, CO. The realignment was designed to take advantage of the similarities between missile launch and space launch operations. Twentieth Air Force, headquarters for the nation's ICBM wings, relocated at Warren Oct. 1, 1993.